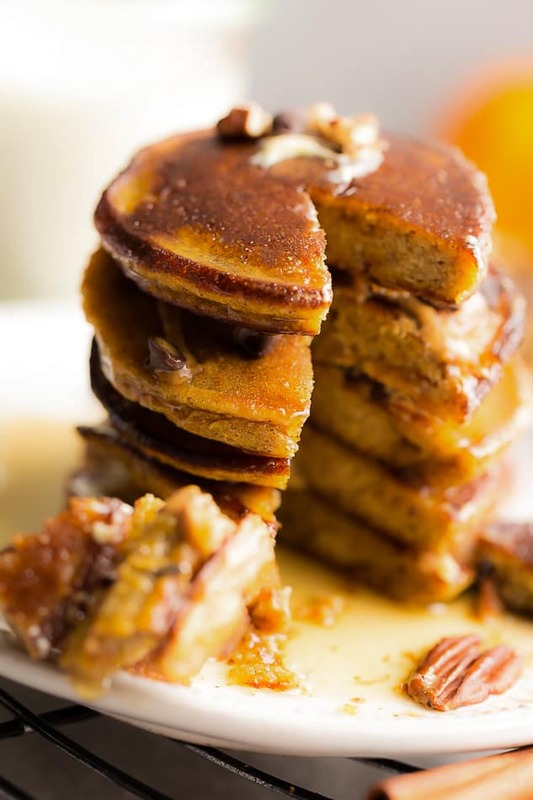 Keto Pumpkin Pancakes – soft, thick, fluffy and perfect for any fall breakfast, Thanksgiving morning or weekend brunch. Best of all, they’re low carb, gluten free and paleo friendly. Weekend breakfasts are an absolute favorite at our house. 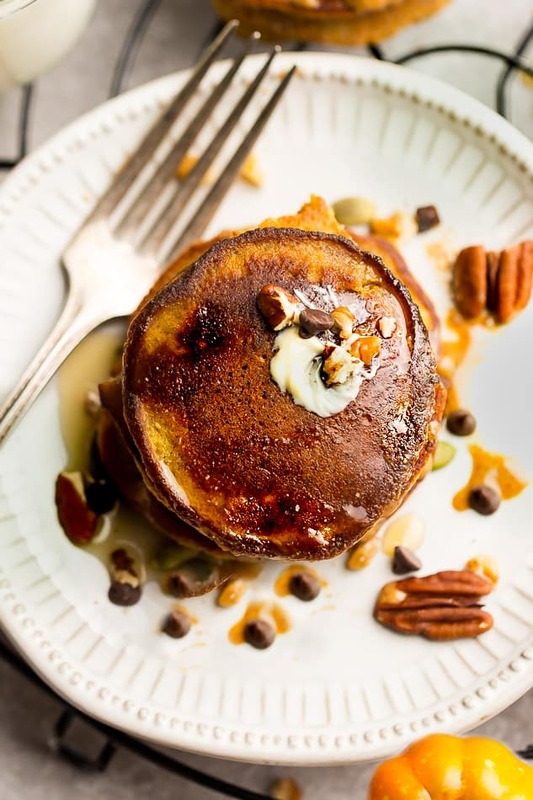 My kids live for waffles and fluffy pancakes and I’ve been on a mission to come up with the best low carb pancakes to satisfy that pancake craving. 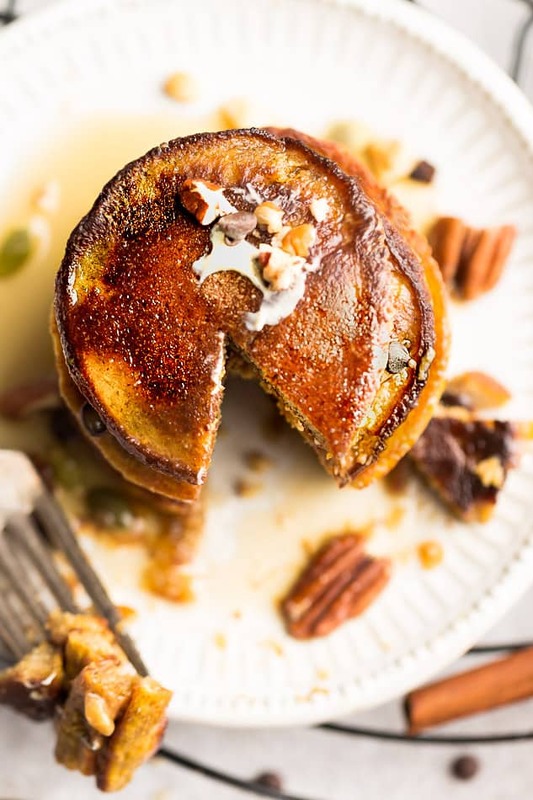 These Keto Pumpkin Pancakes are full of cozy spices and perfect for fall. They’re grain free, paleo / ketogenic-friendly, high in protein and low in carbs. We love that this recipe cooks up thick, fluffy and packed with pumpkin flavor. 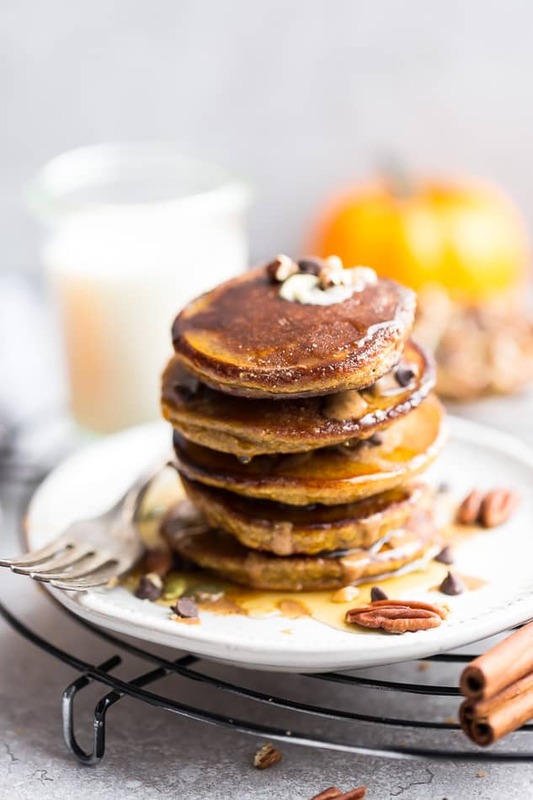 Plus, they’re easy to make requiring just 20 minutes and the batter mixes up in just one bowl so there’s less dishes to wash.
WHAT INGREDIENTS DO I NEED TO MAKE KETO PUMPKIN PANCAKES? Start off by whisking together eggs, almond milk, apple cider vinegar and vanilla extract until smooth. 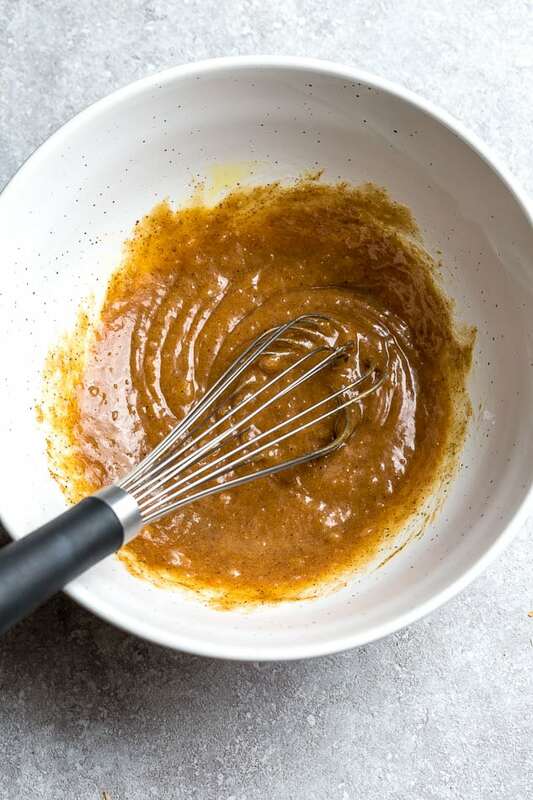 Add the monkfruit sweetener (you can also use erythritol OR Swerve if you prefer), almond flour, coconut flour, baking powder, pumpkin pie spice, cinnamon, salt and stir until combined. If the batter appears too thick, add a splash of almond milk. If too thin, add a bit more flour. Allow the batter to rest for 5-10 minutes. Meanwhile, preheat griddle or a large skillet on medium to medium-low heat. Drop 1/4 cup sized batter rounds onto the griddle. Cook until the edges begin to turn golden brown and bubbles form on the top, about 5-6 minutes. GENTLY flip and cook another 6-7 minutes or until golden brown. Serve with some low carb syrup, chocolate chips, chopped nuts, melted butter / ghee or coconut whipped cream, if desired. 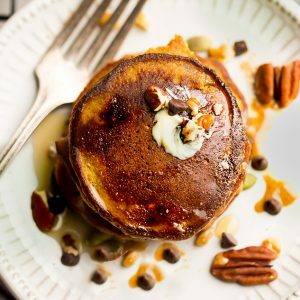 ARE KETO PUMPKIN PANCAKES FREEZER FRIENDLY? 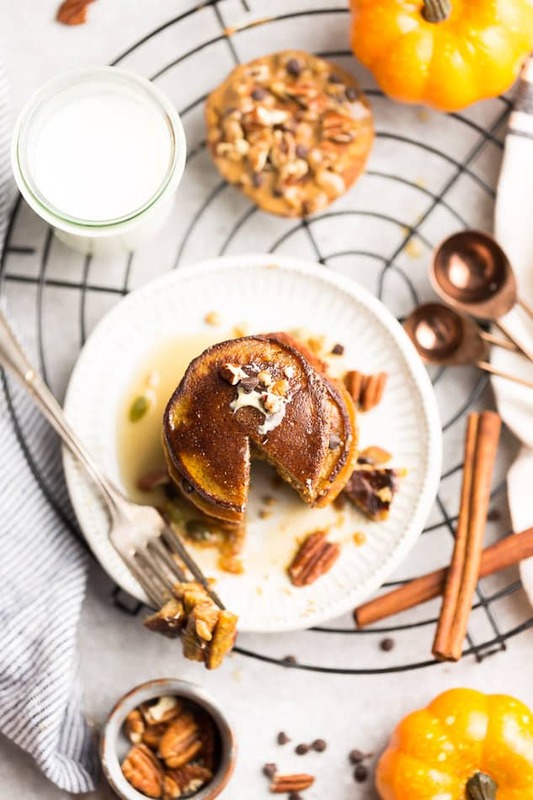 Absolutely, you can make these keto pumpkin pancakes ahead of time and freeze them when you’re ready to enjoy them throughout the week. 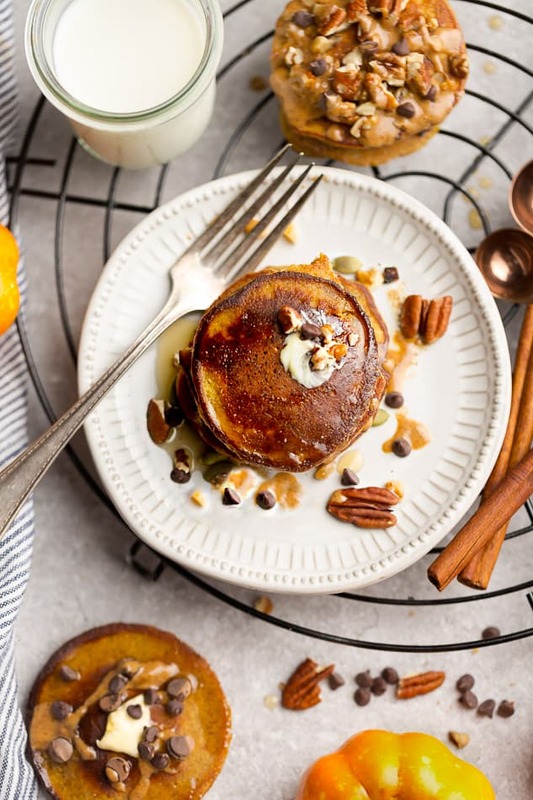 Pumpkin Pancakes – soft, thick, fluffy and perfect for any fall breakfast, Thanksgiving morning or weekend brunch. Best of all, they're low carb, gluten free and paleo friendly. 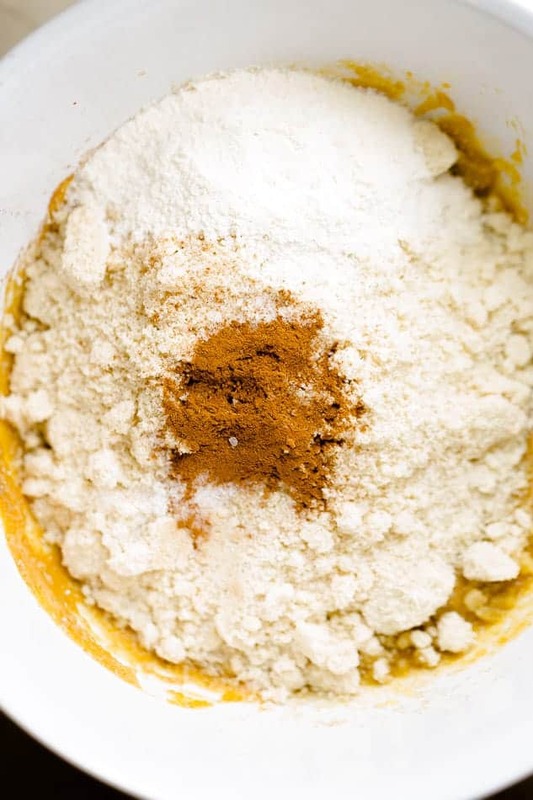 Add the almond flour, coconut flour, pumpkin pie spice, cinnamon, salt, and baking powder and stir until the batter is just combined. These were delicious! Thank you for the recipe!